The Sinn Féin President was speaking after the EU Commission President addressed a joint sitting of the Oireachtas in Leinster House today. Alongside the Sinn Féin TDs and Seanadóirí, Sinn Féin MPs and Martina Anderson MEP were also in the Oireachtas chamber for the speech. The EU chief Brexit negotiator, Michel Barnier, was also in the gallery in the Dáil chamber for the speech. 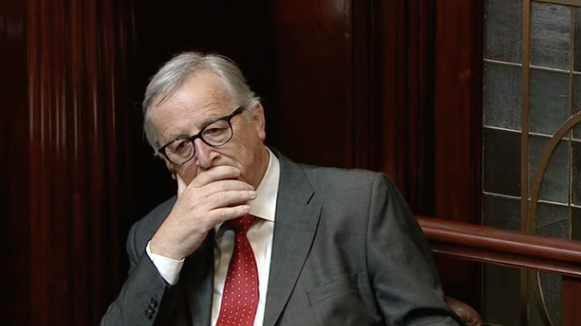 Jean Claude Juncker told the joint sitting that "Ireland will come first" in the Brexit negotiations. He also said dismissed the recent proposal from the British government for the backstop agreed in December to apply to Britain, saying it was designed for the specific circumstances for the north of Ireland. The EU Commission President also warned Britain that time is running out to come up with a deal. "We need more answers and fewer questions," he said Oireachtas members and guests. 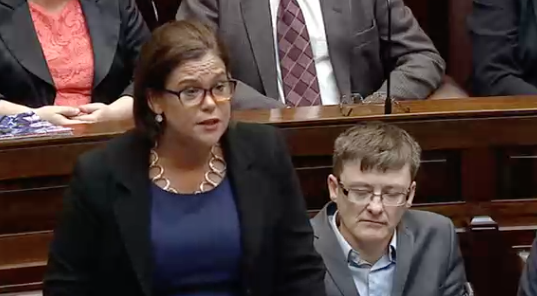 Mary Lou McDonald described Brexit as "the biggest threat in a generation to our all-Ireland economy, our peace agreements and to the rights of our citizens" and added that Ireland must not become collateral damage to the narrow agenda of right-wing British Tories. The Sinn Féin President also said Theresa May and the British government have not put forward any credible proposals and said their approach "remains littered with long-standing contradictions." "The outworking of these unresolved contradictions in British policy is clear. As it stands, the British position would impose a hard border on the island of Ireland. That is a fact. As it stands the British position would erect barriers to east-west trade. That is a fact," she explained. The Sinn Féin Leader told Mr Juncker that the backstop agreed in December, which would see the north remain in the customs union and elements of the single market, must be maintained. "Last December, the people of Ireland were told we had a 'cast-iron guarantee' that that in the event of a no-deal scenario there would be no hard border on the island of Ireland. "The backstop was to be Ireland’s insurance policy to prevent the imposition of WTO trading rules if negotiations ended without a comprehensive agreement. We were told that this draft agreement would be converted into a legally binding agreement by March. This never happened. "Mr Junker, it is absolutely essential that Ireland is provided with this legal guarantee. "The message must go loud and clear to London that the Backstop agreed in December is the bottom-line. And that Backstop must remain in place as long there is an absence of a trade agreement," she said. Deputy McDonald also described the upcoming EU Council meeting is "crunch time" for the Brexit negotiations. "If the architects of Brexit still can’t agree what Brexit looks like, that’s their problem. It will not become Ireland’s problem. "The upcoming Summit cannot become another exercise in kicking the can down the road. It is crunch-time. "In absence of the British government demonstrating how they will avoid a hard border, uphold the Good Friday Agreement and protect citizens’ rights, it would be extremely reckless to allow talks to progress to the next phase. Do not make that mistake," she said. Earlier, Tanáiste Simon Coveney said there could be no agreement unless the issue of the border is resolved. "Let's be very clear, there will be no withdrawal agreement, no transition agreement and no managed Brexit if the British government do not follow through on their commitments in writing to Ireland and the whole EU."